This is one of the cards I’m not so confident about. I think I have a general idea, but it’s not one where I can nod and feel assured in how I translate it, although I’ve never really missed my mark (that I know of) when it comes up in readings for others. Knights represent a change in direction, and they also represent messengers. Their energy is a youthful energy, comparative to that of a teen ager. They’re bold, brave, gung-ho about charging forward on their path, but their armor shows no battle scars – no dents or dings, so they indicate a bit of naivety or lack of experience. Pentacles represent money, or physical manifestations, completion of a thing. 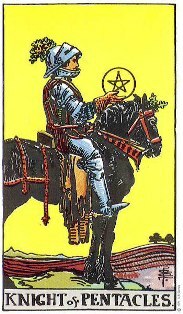 On the positive side, the Knight of Pentacles is like a bulldog. Once he bites down, you can be sure he won’t let go. He’s dogged in pursuit of his goals. A hard-worker, he has tremendous stamina and dedication. Every job is always completed down to the last detail. He’s careful and prudent, never wasteful. He knows the facts and is immune to false promises. On the negative side, this Knight is a bit stodgy and dull. He’s not known for his playful sense of humor. Work always comes first. He tends to be inflexible and obsessive about little details. Stubborn to a fault, he refuses to give in even when wrong, something he’ll never admit. He doesn’t like change or risk and will always take the gloomiest view. If his style is evident, then balance is needed. Are you working too hard? Do you refuse to listen to reason? Do you have a perfectionist in your life? Is the atmosphere around you one of gloom and doom? It may be time for a change. If this Knight’s energy is missing, a dose of prudence may be called for. Are you spending too much? Maybe it’s time to slow down. Do you give up too soon? Dig in and refuse to quit. Is your work often careless, late or incomplete? Next time resolve to work up a sweat and get the job done. Let the Knight of Pentacles introduce you to his world of care and persistence. Well, that translation doesn’t sound anything like mine. But, that’s why I do this every morning – not only to gauge the influences of my own day, but to gain a deeper understanding of the cards. Knights or princes are the spirit of the teenager, all about changes. Knights are never still; as the pages/princesses suggest messages, the knights/princes suggest movement, travel. Elementally, they are Air moving and flowing like that element. As a person, they’re likely to stand for a young adult or someone who acts very like a teen. Their beliefs are purer than of an adult, less cynical and more fierce. In this they are most knight like: powerfully, almost unquestioning loyal to a kingdom or cause. Ah… so it’s the Pages that are messengers, NOT the knights! Noted! As travel: Knight of Pentacles – Travel on foot, hiking, walking, cycling. This teen appreciates the very best things money can buy – not only because he likes such things, but because he doesn’t like to stand out. He’s got projects going, jobs on the side, he fears not having what others have, not fitting in. In comparison to the Knight of Wands, however, this teen likes being at home. He needs to have his own room or secret place, and woe to anyone who goes into that room or changes it in any way. This teen has his own organization system for everything. On the negative side, this teen can be far too solitary, too concerned with perfection, what he does or does not have, or earning a place of respect. Fear of failure or competition or standing out may keep him from leaving his room. He values and protects beautiful things and is a loyal employee if treated right. Okay, well, I may have missed my own interpretation, but this card hits the nail on the head for today. In fact, when I was shuffling the deck, T called – he’s coming by to bring a bed, a chest of drawers, and a few other items to turn that back bedroom into a bedroom for me. For the four years I’ve lived in this house, the master bedroom has been unable to be used. My ex took a power saw to the wall and cut a hole through the house from that bedroom to lead to the dog kennel he’d built. That room has since been called “The pet room”. So for the first three years I lived here, I slept on the floor in the living room. After the ex moved out and I’d bought my own furniture, I switched to sleeping on the sofa. T has been trying to get me to convert that room back into a bedroom for a bit now, but I’ve resisted because I don’t want to be “comfortable” in this house. I don’t want to nestle in… I want to MOVE! But, he has valid points and I think I’ll feel much more at peace and well rested if I have a bedroom of my own. He replaced the carpets in that room not long ago, and today he’s determined to furnish it. One of my biggest complaints over the past four years is that I don’t have a sacred space to call my own… a private room where I can close the door and be alone. The talk in this card of perfectionism, working hard, etc. matches me quite well and I see myself in it, but I also see a great deal of Rhythm in this card. I’d love to talk more about today’s card and how it matches up with my current situation, but now that I know I have company on the way, I’m a bit hurried… perhaps I’ll come back later in the day and reflect on it some more. I do want to say, though, that my own interpretation wasn’t far off for me personally in regard to today… I said a message and/or gift… and while I was shuffling the deck, I got a message from T that he was bringing furnishings for that room… so I don’t think I was “wrong”, I just think my interpretations weren’t aligned with other interpretations. For now, it’s time to draw a faerie.